This week’s replay comes from our Discord channel. We hope you’ve been enjoying these replay spotlights, but in the future we may move on to try out other types of content for the community. This weeks replay immediately intrigued me when I looked at the active army chart and saw that for the last several minutes of the game the Zerg only had Swarm Hosts vs a group of Bio and Medivacs, but the hero unit for our Zerg player was a Zergling with 3 SCV kills. Initially I wondered how the Zerg player survived the last 8 minutes of the game on Swarm Hosts alone without any of them getting more kills than that, until I remembered that due to their unique nature kills are not properly tracked for Swarm Hosts (or Banelings). I still think it was a great replay, though, and I hope you do too! The beginnings of this game look a lot like an ordinary TvZ, but there are some subtle clues as to the personalities of each player that foreshadow how the rest of the match will play out. In the first clip, instead of waiting for the drop to poke again the Zerg loginn takes the initiative, eventually devouring it’s prey. In the second clip, instead of chasing down the Zerglings and preventing them from morphing into Banelings, the Terran player TerranEZ heads right for the drone line. Finally, the last clip illustrates how the Terran player is successfully keeping the Zerg player from taking a forth as well as weakening his economy, which he continues to successfully do until the tipping point of this match. Eventually the Terran player’s continual harass pushes the Zerg, loggin, over the edge — just as he got tired of waiting for the drop to poke in the early-game, he now also gets tired of waiting and takes action. The Terran player, on the other hand, continues to ignore the Zerg’s army in favor of heading for economic damage. These two factors, as well as the unusual choice of Swarm Hosts (!?) cause this game to take an interesting direction as both players are left gutted. With almost no economy left, any unit lost now is a step closer to death. The Swarmhosts fail to pull their weight, a target fire would have brought down the Orbital Command in seconds but instead they do minimal damage. With a critical Widow Mine hit, this fight seems to be swaying heavily in favor of the Terran player until the genius move at the end were Hold Position Swarm Hosts block the Terran bio, trapping them with some Banelings. This leaves the game in an interesting position. TerranEZ still has a force of bio backed with the highly mobile Medivacs, and our Zerg player only has Swarm Hosts, which can’t keep up with the frantic pace of Marine drops. If only our Zerg player had some Infestors to hold those Marines in place with Fungal Growth. . . This clip contains a roller-coaster of emotions, from the scouring of the Hatchery to every Infestor dying. Unfortunately for our Terran player, the fact the Zerg player could even afford that many Infestors was a bad sign, and many men fell in the process of killing them. One of the Terran’s own Orbital Commands fall, leaving the Zerg player significantly ahead in economy, even if catching Medivacs with Swarm Hosts is an impossible task. Every action movie needs a chase scene! As hilarious as it is to watch Swarm Hosts case Medivacs, the last few minutes of this match were sort of a pointless charade. It never hurts to stick around and keep trying, but I think TerranEZ knew it was a losing battle. 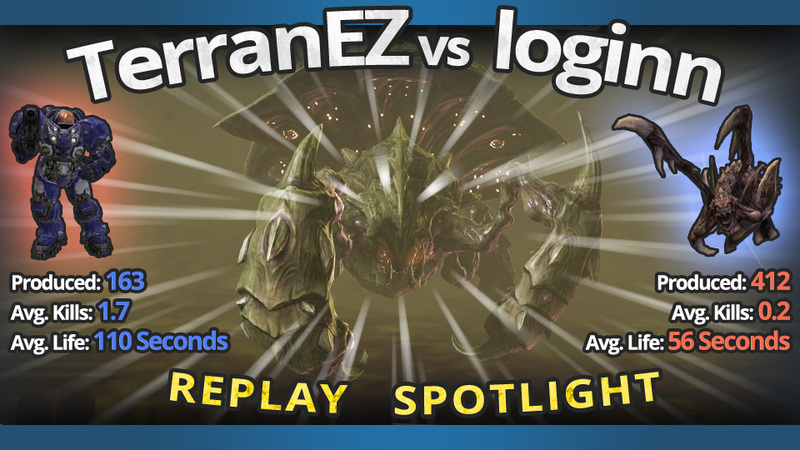 As agile as Marine Medivac is, the Zerg player had more endurance because of his economic advantage. GG!